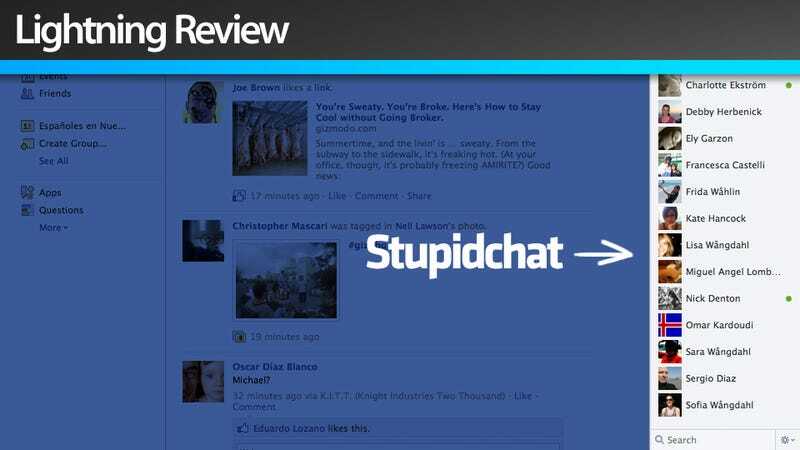 Facebook, Why Did You Screw Your Chat System? Before, Facebook's chat showed only the people you wanted on the chat window. In fact, of those people, only the ones who were online showed up. Maybe it was that way because it made bloody sense. You know, so they can actually reply to you. You see someone you want to chat with. You write. They reply. We chat. In real time. But the new design completely ignores the real time nature of chatting in favor of this moronic idea that chatting is actually like emailing, but shorter. Or viceversa. Whatever the hell. Which is why they merged their chat and messages into a single inbox and why they have done this to their chat system. To Facebook this may make sense. To the users, it's just incredibly useless, counterintuitive, and it results in a total waste of space, a clusterzuck of names that doesn't serve any purpose but confuse them. Instead of presenting you with the online people who you want to chat with, Facebook now shows a long list of people that doesn't make much sense—a list made up with whoever the bollocking hell Facebook guesses you may be interested in chatting with. And all of them show up, no matter if they are online or not. So clever! Let's admit that the concept of Facebook guessing who you may want to chat with could be a valid one (in practice, most of my Facebook's guesses were dumbtastically useless). Why oh why do we have to see everyone regardless of their status? They mark those who are online with a green dot, but otherwise most of the people in the list are almost never there. But the stupidity doesn't stop there: While Facebook says that they will not show you as "available" to the people who are not in your active chat lists, they will show to you those people anyway. Why the hell do I want to see someone who is specifically excluded from seeing me online? It just doesn't make any sense. Hopefully, they will fix this moronic user experience soon. Just add "Show only online friends" and "Show only people in xxxx list" options and everything will be fine.